Elevate the style in your backyard by placing these Gardman Black Gothic Trellises in it. These 3, hardy steel trellises bring a classic look to your garden, thanks to their arched tops and black tone. A uniform, rectangular grid creates the bottom of each of these units, while diamond-shaped openings rest beneath the top arch. This evokes the windows and other decorative accents found on Gothic style cathedrals, and the steel construction lasts for many seasons. The two legs on each unit are simple to stake into soil, while the bevy of intersecting rods provide places for tendrils to grip. Bring an architectural hint to your garden with these Black Gothic Trellises. 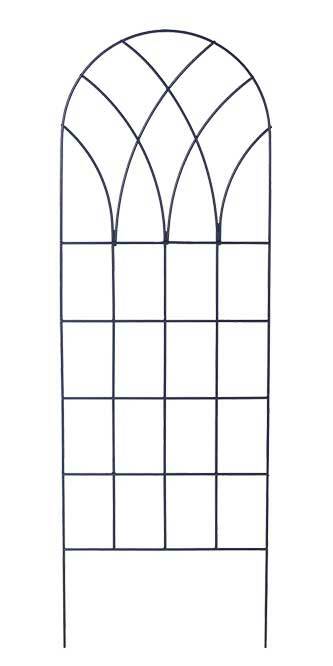 Note: This case pack includes 3 of the Gardman Gothic Trellises, Black, 72"H.
Rail Dimensions: round rails, 0.25" dia.